Join Artist Joyce Raimondo as she guides you through this creative program. Explore the basics and science of color mixing, to improve your painting skills and make your artworks come to life! No prior painting experience necessary. Everyone paints at their own level. Adaline Bowman (Blake Lively) has miraculously remained a youthful 29 years of age for nearly eight decades, never allowing herself to get close to anyone lest they discover her secret. However, a chance encounter with a charismatic philanthropist named Ellis Jones (Michiel Huisman) reawakens Adaline’s long-suppressed passion for life and romance. When a weekend with Ellis’ parents threatens to expose the truth, Adaline makes a decision that changes her life forever. 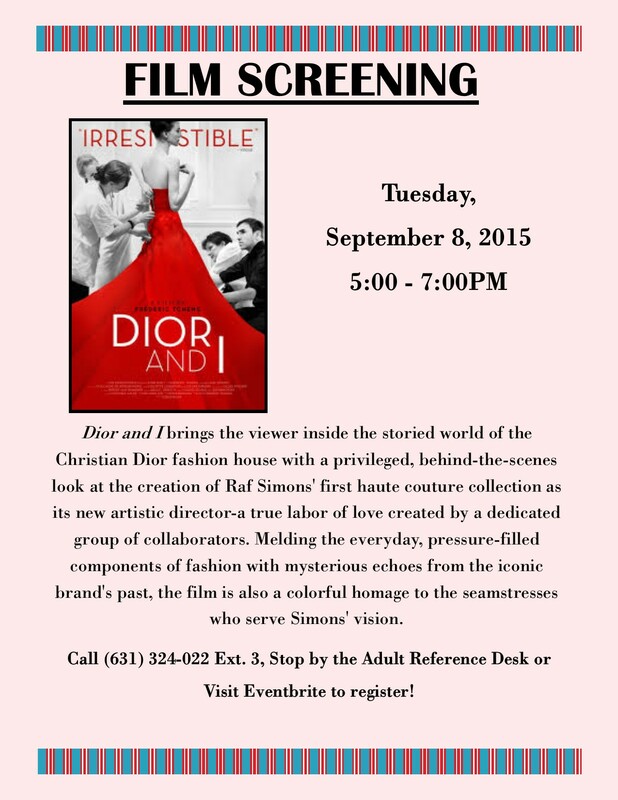 Dior and I brings the viewer inside the storied world of the Christian Dior fashion house with a privileged, behind-the-scenes look at the creation of Raf Simons’ first haute couture collection as its new artistic director-a true labor of love created by a dedicated group of collaborators. Melding the everyday, pressure-filled components of fashion with mysterious echoes from the iconic brand’s past, the film is also a colorful homage to the seamstresses who serve Simons’ vision. Join the East Hampton Library for a screening of the 1953 classic Musical Kiss Me Kate, in a brand new 3-D Transfer. Divorced Broadway stars Fred Graham (Howard Keel) and Lilli Vanessi (Kathryn Grayson) agree to star in a musical adaptation of William Shakespeare’s “Taming of the Shrew” alongside rising young actors Lois Lane (Ann Miller) and Bill Calhoun (Tommy Rall). Backstage complications pile up due to a romantic misunderstanding between Fred and the soon-to-be-remarried Lilli, while Bill’s gambling debts cause a pair of lunk-headed mobsters (Keenan Wynn, James Whitmore) to become part of the show.